From today, some interesting entries for readers will be published in English. This first entry will explain the physical reasons because tin whiskers are generated on surfaces of copper or zinz, and methods to prevent this phenomenon. Whiskers are a small tin wires, growing due to differences in surface tension at the binding surface of the metals, when an electrochemical plating is applied. In 2006, the author and his R&D team had to research this phenomenon. Researchers found the functionality of one product is spoiled along the time. Particularly, when it was stored more than three months. Then, we decided to study this phenomenon, to understand the causes because it produces and find possible solutions to prevent in future developments. Occurrence of uncontrolled phenomena is important for the Research & Development in any factory. Most of the time, private companies applied more the Development than the Research in their products. However, there are many times where the development has drawbacks and phenomena that are not in the company “know how”. These phenomena enable R&D teams to acquire new knowledge and apply it in the future. In 2006, my R&D team found a phenomenon affecting the proper operation of one popular product. It was completely unknown to us, but experienced by others: whiskers. It occurred in one important product that we were developing. Because this product was the most important in our catalog, forcing us to do a deeper research, to find a solution, because there were stored material which might be defective. So my R&D team got to work to solve this phenomenon. Whiskers are a type of mammalian hair, with large size. In Mechanical Engineering, whiskers are tin filaments that grow on a material that has been processing by electroplating. Electroplating is used in the industry, because it serves for fine finishes, easy weldability or protect to corrosion. In our case, electroplating is made with tin and zamak (a zinz, magnesium, aluminum and copper alloy, widely used in industrial housings), to facilitate the weldability on the zamak (it is not weldable), and provide a well-finished product. Therefore, the knowledge of the phenomenon and the possible solutions was very important for us. This phenomenon appeared on Zamak housings, because they must submit a tin plating to weld on the housings, because Zamak does not allow conventional welding. A drawback happened when, after a large time stored material, this product, a narrow-band amplifier with an 8MHz cavity filter, had a strong deviations in its electrical features. This phenomenon forced to do a new resetting of the filter. In this product, there were two separate settings: first, made during the assembly, and second, 24 hours from the first adjustment. After completing both settings, the cavity filter usually remained stable, but a third setting was recommended if the product was stored over 3 months (storage rotation). However, along the product development, my R&D team discovered that the cavity filter was not stable and the failure of the selectivity and insertion losses grew along the time. Implying that, despite the third adjustment, could not ensure the filter stability. This failure meant that we could not ensure that the filter was stable in spite of third adjustment. At first, the phenomenon looked like a failure in the electronic components, caused by a defective lot of capacitors. Then it became a new phenomenon for us: we had accidentally generated whiskers on tin surface. 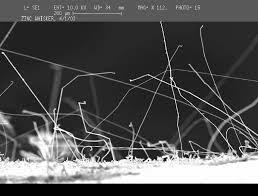 As I said, whiskers are metal filament-like crystals, which grow on the surface of tin which covers the zamak housing. Crystals are so fine that they are very brittle when the hand is passed over the surface and melt when a short circuit current crosses through them, which it does not have to be very high. In this case, it reduced the cavity volume of the filter, and it changed its resonant frequency, moving the insertion response to higher frequencies. According to the experimental observations, both equations predicted rather accurately the whiskers growth which was observed in the tin layers. In these equations, σ represents the stress strength, related to the surface tension. LW is related to thickness of the surface bonding and n is a value, dependent on the displacement density and the temperature, T. The k1, k2 and k3 terms are constants which depend on the material properties and RW is the radius of the filament. The h1 and h2 terms refer to the filament growth where it has already happened in the bonding area (h1) and the time at which happens (h2). In these equations, when LW decreases, h2 increases, because it is an exponential function with n>>1. Therefore, the plating thickness is one of the variables which can be controlled. 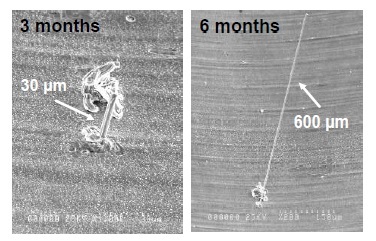 In our case, this thickness had been decreased from 20μm to 6-8μm because the development incorporated a “F” plug-type, threading, instead of the former 9 ½mm DIN connector. Since the connectors were made in the molding manufacture and they were subsequently threaded, they were made before the tin plating. A 20μm tin plating did not allow that the connectors were threaded. The σ term is related to the surface tension in the junction and depends only on the materials used. Studying with the plating manufacturer for different thicknesses, we verified that the expressions were consistent, since for larger thicknesses, the growth was always much higher than for smaller thicknesses, and there was always a tendency to grow, although it was lower in 20μm platings. Once the plating was made, the stress forces which were applied by the surface tension of zamak, “pushed” to the tin atoms outwards, to maintain the equilibrium conditions. Opposite to them, the surface tension of tin appeared. 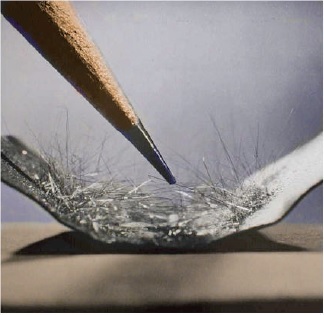 With less tin thickness, the forces applied at the contact surface were higher than the opposite forces on the tin surface, and with less tin thickness, internal forces which opposed to the surface forces were weaker, allowing the whisker growth outside. One solution, that was provided from Lucent Technologies, was performing an intermediate nickel plating, between zinz surface and the tin plating. Researchers from Lucent Tech., after several experiments, found that the growth of whiskers was eliminated significantly, to nearly zero values. 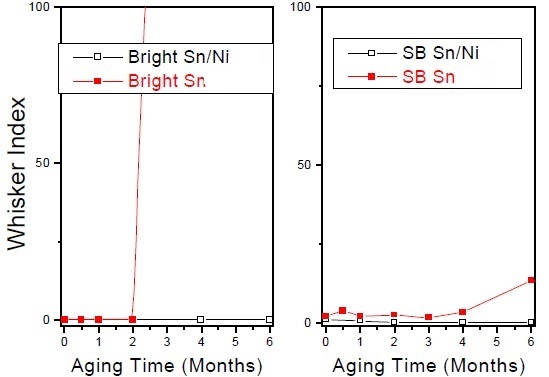 In the graphs, we can see that the growth of bright tin over a copper surface which has a similar performance to the zamak. It grows rapidly after 2 months. The growth slope is very high in bright tin. However, when it is applied an intermediate Ni layer, the growth is practically zero. For the satin tin, the growth slope happens after 4 months, and it shows a slightly lower slope. After applying the Ni layer, the growth is practically zero. The thickness of the Ni plating could be between 1μm and 2μm, while the thickness of tin plating could be maintained around 8μm. Thus, the defective threading is avoided while the whiskers were removed. However, the process was quite expensive, so this option was discarded. Therefore, we were confronting another problem: how to eliminate the phenomenon, which implied increasing the thickness of the tin plating on the zamak alloy, but also caused the defective in threading at “F” connector. A molding modification, to provide more material on the connector, was quite expensive and involved a larger modification time, having to include inserts. However, it was right to correct the whiskers. Another problem was raised with the stored material and the material which was being manufactured. The stored material could not be reprocessed because it had been assembled and could not be plated again. The intermediate solution was to remove the tin crystals by cleaning with compressed air. About the material in manufacturing process (non-plating pieces), a temporary solution was to replace the tin plating. Silver plating was applied. Silver is weldable and can be applied in very thin layers, keeping the features, but it has the disadvantage that its oxide shows a dirty and stained finish, affecting to the product esthetics. Finally, in-depth study of the phenomenon laid down that increasing the tin thickness should be standard. Defective in threading should be removed by a tool, to make correctly the threading on the connector, and the mold modification could be made, by modifying the inserts of the threaded connectors, to get a 10-20μm plating which do not fill the threadings. Tin whiskers is a little-known phenomenon. It happens at the microscopic level and seems to have only been studied by agencies and national research laboratories, with strong budgets and appropriate means for its observation. In Spain, we have found few laboratories which study it. It happens preferably in the industry, caused by the handling of materials. This job was done by my R&D team, allowing us to acquire enough knowledge to correct and prevent it, as well as to avoid its occurrence again. However, there are many items about it on the web, which allowed us to know, analyze its causes and possible solutions. Esta entrada se publicó en Analysis, Crystallography, Materials, Spreading, Theory, Whiskers y está etiquetada con industry, materials, physics, research, theory en noviembre 19, 2014 por Tomás Rosich. La entrada trata de explicar los motivos físicos que generan la aparición de whiskers sobre superficies de estaño que bañan soportes de cobre o de zinz y los métodos que facilitan la prevención de su aparición. Los whiskers son filamentos de estaño que aparecen debido a las diferencias en la tensión superficial en la suferficie unión de ambos metales cuando se produce un baño electroquímico. En 2006, el autor, junto a su equipo de desarrollo de I+D, se encontraron con este fenómeno mientras estaban renovando un producto del catálogo de ALCAD. El equipo de I+D, a la vista de este fenómeno, que con el tiempo estropeaba la funcionalidad del producto, sobre todo cuando llevaba almacenado más de tres meses, se propuso estudiar el fenómeno, comprender las causas que lo producen y buscar posibles soluciones para su prevención en futuros desarrollos. No hay nada mejor que la aparición de fenómenos no controlados para que se produzca Investigación en una empresa. La mayoría de las veces, las empresas privadas usan más de la D que de la I, en el desarrollo de sus productos. Sin embargo, hay ocasiones en las que un desarrollo presenta inconvenientes y fenómenos que no aparecen en el “know how” de la empresa. Estos fenómenos permiten a los equipos de I+D adquirir nuevos conocimientos y aplicarlos en el futuro. En el año 2006 mi equipo de I+D en ALCAD se encontró un fenómeno que afectaba al correcto funcionamiento de un producto en desarrollo. Un fenómeno totalmente desconocido para nosotros, pero que ya lo habían sufrido otros. Un fenómeno conocido como whiskers. La aparición de este fenómeno producía un defectivo en el producto que estábamos desarrollando. Siendo este producto uno de los más importantes de nuestro catálogo, nos obligó a plantearnos su estudio con mayor profundidad, a fin de buscar una solución, ya que había almacenado material que podría presentar un defectivo de dimensiones considerables. Así que nos pusimos manos a la obra y todo el equipo de I+D implicado nos dispusimos a acabar con este problema. En inglés, whiskers hace mención a los pelos del bigote de los gatos. En ingeniería mecánica, los whiskers son filamentos metálicos que crecen sobre un material que ha sido bañado con estaño de forma electroquímica. El baño electroquímico de los metales es habitual en la industria, ya que sirve para obtener acabados finos, facilitar la soldabilidad o proteger materiales más propensos a la corrosión. En nuestro caso, el baño electroquímico de estaño se hacía sobre zamak (aleación de zinz, magnesio, aluminio y cobre, muy utilizada en los productos industriales por su facilidad para la inyección en molde), a fin de facilitar la soldabilidad del zamak, ya que éste no es soldable, y proporcionar un acabado al producto. Por tanto, conocer el fenómeno y sus posibles soluciones era importante para nuestro equipo de I+D. El fenómeno aparecía en los chasis de zamak que debían presentar un acabado de baño de estaño para poder realizar soldaduras en el soporte, pues el zamak no permite soldadura convencional. El problema surgió cuando, después de un tiempo almacenado el material, el producto, que consistía en un amplificador de banda estrecha, con un filtro de cavidad ajustado a un canal de 8MHz, presentaba desviaciones en su respuesta eléctrica. Esto obligaba a un reprocesado del filtro en Producción. En versiones anteriores del mismo producto, la una característica de ajuste en Producción obligaba a sendos ajustes en el tiempo: el primero, realizado durante el ensamblado del producto y el segundo, a las 24 horas del primer ajuste. Una vez realizados ambos ajustes, el filtro de cavidad permanecía estable, aunque se recomendaba un tercer ajuste si el producto quedaba almacenado más de 3 meses (rotación del almacén). Sin embargo, durante el desarrollo de este producto, el equipo de I+D descubrió que el filtro no permanecía estable y que, además, el deterioro en la respuesta crecía con el tiempo. Lo que implicaba que, a pesar de hacer un tercer ajuste, no se podía asegurar que el filtro se mantuviese estable, lo que podía llevar a un proceso sin fin. Lo que al principio parecía un problema de componentes electrónicos, con un lote defectivo de condensadores, se convirtió en un fenómeno nuevo para nuestro equipo: habíamos generado, sin quererlo, whiskers sobre la superficie de estaño. Como he dicho anteriormente, los whiskers son cristales tipo filamento que crecen sobre la superficie de estaño que baña el zamak. Son cristales tan finos que son quebradizos cuando se pasa la mano sobre la superficie, y funden cuando les atraviesa una corriente de cortocircuito, que no tiene por qué ser muy elevada. En el caso del filtro se producía una disminución volumétrica de la cavidad, y esto modificaba la frecuencia de resonancia del filtro, desplazando la respuesta a frecuencias más altas y desadaptando el filtro. Según las observaciones experimentales realizadas, ambas expresiones seguían con bastante precisión el crecimiento de los whiskers observados en las capas de estaño. En las expresiones, σ representa la fuerza de stress, relacionada con la tensión superficial, LW está relacionado con grosor de la unión y n es un valor que depende de la densidad en el desplazamiento y de la temperatura T. Los términos k1, k2 y k3 son constantes que dependen de las propiedades de los materiales utilizados y RW es el radio del filamento. Los términos h1 y h2 se refieren al crecimiento del filamento cuando ya se ha producido éste en la zona de unión (h1) y en el momento en el que se produce (h2). Nótese de estas expresiones que a menor LW, el término de la expresión de h2 crece ya que es una función exponencial en términos de n>>1. Por tanto, el grosor del baño es una de las variables que hay que controlar. En nuestro caso, el grosor del baño había sido disminuido de 20μm a 6-8μm debido a que el producto en desarrollo incorporaba conector roscado de tipo “F”, en lugar de el antiguo conector DIN de 9 ½ mm. Como los conectores se obtenían en el proceso de moldeo y posterior roscado, que se realizaban antes de proceder al baño de estaño, un baño de 20μm no permitía el mantemiento de la rosca del conector. El otro término, σ, está relacionado con las tensión superficial que se producía en la unión, y depende exclusivamente de los materiales utilizados. Estudiando con el fabricante de los baños distintos grosores para el baño de estaño, comprobamos que las expresiones se ajustaban, ya que para grosores mayores el crecimiento era mucho mayor que para menores, pero que siempre había tendencia a que saliese, aunque en menor medida en baños de 20μm. Una vez realizado el baño, las fuerzas de stress generadas por la tensión superficial del zamak “empujaban” a los átomos de estaño hacia el exterior, con el fin de mantener la posición de equilibrio. A ellas se oponía la tensión superficial del estaño. Pero con menor grosor del baño, la fuerza generada en la superficie de contacto era superior a la de la superficie del estaño, y al tener menos grosor, las fuerzas internas que se oponían a la fuerza de la superficie eran más débiles, permitiendo el crecimiento al exterior del filamento. Una de las soluciones que aportaron desde Lucent Technologies era la realización de un baño intermedio de níquel, depositado entre la aleación de zinz y el baño de estaño. El equipo de materiales de Lucent Tech., después de varios experimentos, encontró que el crecimiento de los whiskers se eliminaba notablemente, llegando a valores prácticamente nulos. Crecimiento de ambos tipos de baño de estaño (brillante y satinado). En las gráficas podemos ver que el crecimiento del estaño brillante sobre una superficie de cobre, que presenta similar comportamiento que el zamak, a los 2 meses crece rápidamente. Sin embargo, cuando se le aplica una capa intermedia de Ni, el crecimiento se queda en valor nulo. En el caso del estaño satinado, el crecimiento se produce a los 4 meses, y es levemente inferior. Aplicando Ni, el crecimiento se anula. El grosor del baño de níquel podía ser de entre 1μm y 2μm, mientras que el grosor del estaño se podría mantener en torno a 8μm. De este modo, se evitaba el defectivo del roscado al mismo tiempo que se eliminaban los filamentos. Sin embargo, el proceso era bastante caro, por lo que esta opción quedó descartada. Por tanto, nos encontrábamos frente a un problema: cómo vencer al fenómeno, que implicaba aumentar el grosor de la superficie que baña al zamak, pero que también provocaba que desapareciese el roscado del conector “F”. Una modificación del molde para dotar de más material al conector era costosa y conllevaba bastante tiempo de modificación al tener que realizar postizos en el mismo. Sin embargo era la idónea para corregir el proceso. El problema se planteaba con el material almacenado y el material en proceso. El material almacenado ya no podía ser reprocesado puesto que estaba montado y ya no se podía bañar de nuevo. La solución intermedia fue eliminar los cristales de estaño que habían crecido mediante su limpieza con aire comprimido. Sobre el material en proceso (piezas desmoldeadas sin bañar), se aplicó una solución temporal que consistía en la sustitución del baño de estaño por baño de plata. La plata es soldable y se puede aplicar en capas muy finas manteniendo las características, pero presenta el inconveniente de que su óxido proporciona un acabado sucio y con manchas, afectando a la estética del producto. Al final, el estudio en profundidad del fenómeno hizo que la opción de incrementar el grosor del estaño se convirtiese estándar y eliminado el defectivo del roscado mediante el uso de una terraja que realizase el roscado sobre el material, hasta que se realizase la modificación del molde, modificando el postizo de los conectores roscados para que un baño de 10 a 20 micras no obturase las roscas. Los whiskers de estaño es un fenómeno poco entendido, se produce a nivel microscópico y parece que sólo ha sido estudiado por agencias y laboratorios de investigación nacionales, con fuertes presupuestos y dotados con medios adecuados para la observación del fenómeno. En España se han encontrado pocos, o prácticamente ningún laboratorio, que estudiase este fenómeno en profundidad, que tiene su aparición preferentemente en la industria, por la manipulación de los materiales, por lo que casi todo el trabajo fue realizado por el equipo de investigación y desarrollo de la empresa, adquiriendo el conocimiento del medio suficiente para corregirlo y evitar que aparezca en un futuro. Sin embargo, hay muchos artículos relacionados con el fenómeno, lo que nos permitió conocerle, analizar sus causas y sus posibles soluciones. Esta entrada se publicó en Análisis, Cristalografía, Divulgación, Materiales, Teoría, Whiskers y está etiquetada con electrónica, física, industria, Investigación, materiales, teorías en noviembre 22, 2013 por Tomás Rosich.